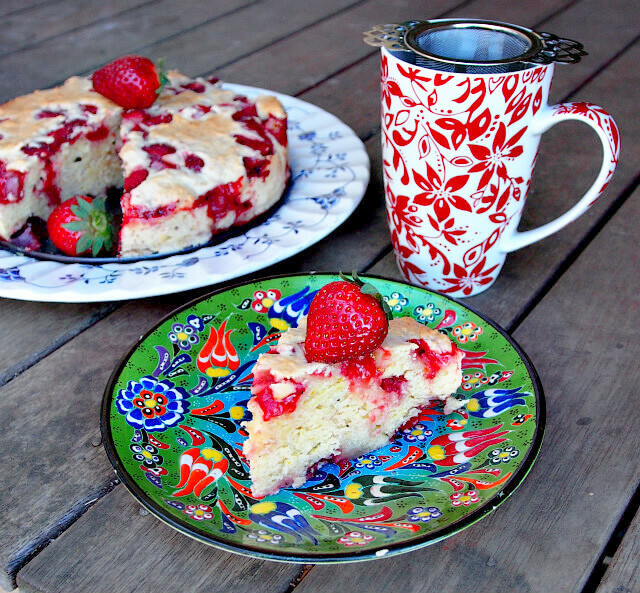 Strawberry Buckle Cake is a lovely old-fashioned recipe from the early days of American cooking. It’s simply a coffee cake-type batter studded with fresh, seasonal fruit. Although the origin of the name is lost to time, many believe it refers to how the batter buckles around the fruit that softens and breaks down during the baking process. Regardless of how it got its name, a strawberry buckle cake is easy, simple, and absolutely delicious. A traditional buckle cake can be baked with a streusel topping or without. While the streusel is good, I like to make my strawberry buckle cake without it so the rustic beauty of the dessert is on full display. 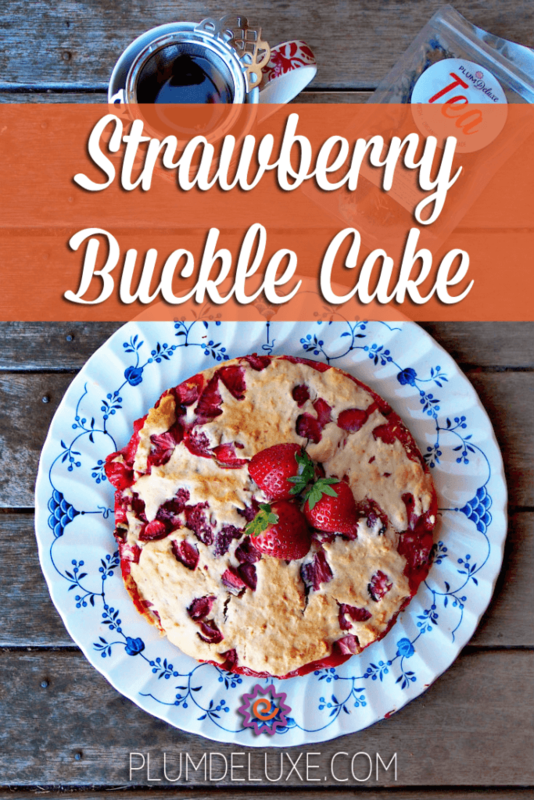 A buckle cake can be made with any fruit, from peaches and pineapple to pears and plums, but it works especially well with berries. Whether you like blackberries, blueberries, raspberries, or strawberries, they’re all divine in this dessert. 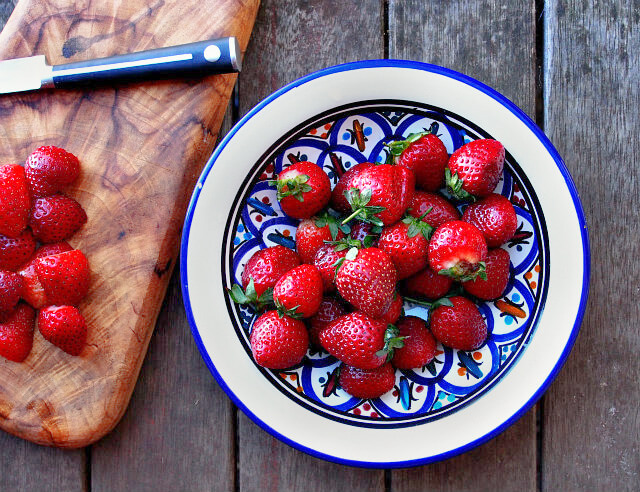 I chose fresh, ripe strawberries for this version, and they were beautiful. I’m a big fan of strawberries, whether they’re piled on top of our Fluffy Strawberry Shortcake, layered in our Showstopper Victoria Sponge cake, or tossed with prosecco on our Strawberry Champagne Cake. The batter for this cake is dreamy, made with real butter and not too much sugar. Traditionally flavored with vanilla and lemon, I changed things up a bit by substituting luscious orange extract, fresh-squeezed orange juice, and a heaping tablespoon of vibrant orange zest. This keeps the cake moist and adds a bright, citrusy fragrance and flavor that pairs wonderfully with the strawberries. It’s also really nice with lime zest or mandarin zest or finely diced kumquats; tiny pieces of candied ginger would be a welcome addition. While you can often successfully substitute frozen strawberries in dessert, it’s best to use fresh strawberries in this strawberry buckle cake. They keep their shape much better and don’t bleed nearly as much as frozen ones. This ensures a pretty cake with a clear distinction between the white cake and deep red strawberries. You can roughly chop them or take the time to cut each one into quarters. If you want to give them a sweet boost, you can toss them gently with real maple syrup before stirring them into the batter. While you can serve this strawberry buckle cake either warm and cold, my test audience declared that it was best served cold. We enjoyed it served in thick wedges, plain or drizzled with heavy whipping cream; but, hands down, our favorite way was in slices slathered with cold, salted butter. Once it has cooled, this strawberry buckle cake can be sliced into handheld portions, so it makes an excellent cake to take on a picnic, road trip, or to share at a potluck or family reunion. 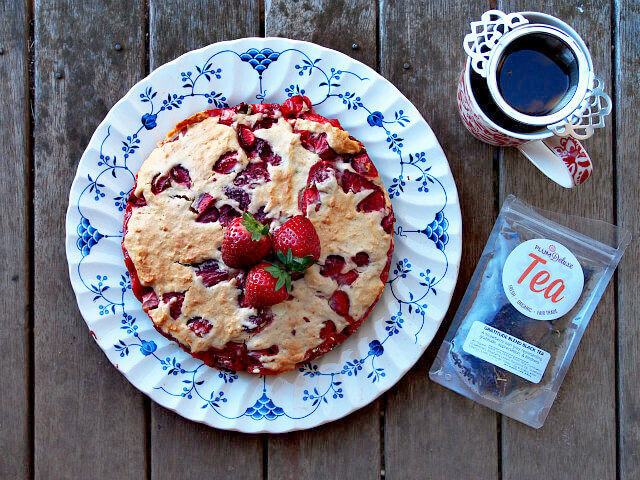 It goes beautifully with hot or iced beverages, and is especially good with our Gratitude Blend strawberry Earl Grey tea or Sugar Plum black tea with plum, strawberry, and cardamom. Grease and flour 10-inch cast iron pan. Set aside. In medium bowl, beat together butter and sugar for 2 minutes. Add orange extract, eggs, salt, baking powder, orange zest, orange juice, and milk. Beat together until smooth. Add flour, half a cup at a time, mixing gently with wooden spoon after each addition. 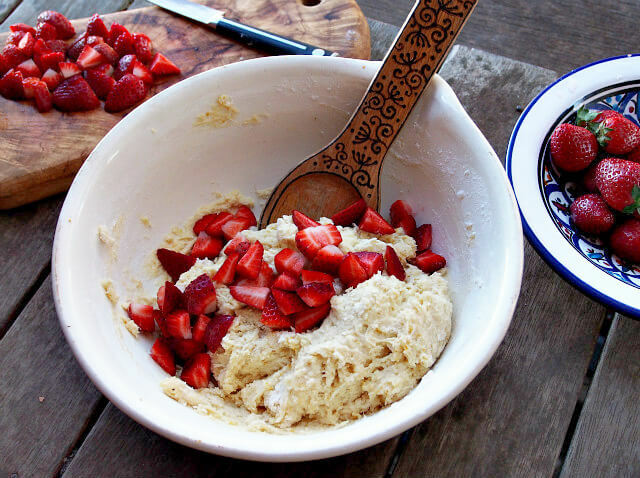 Add strawberries and mix gently with wooden spoon. Pour batter into prepared pan and bake 45 minutes until top is golden brown and toothpick inserted in center comes out clean.